﻿ The fall harvest is on! The fall harvest is on! For at least another week, it appears there will be no frost warning along the Front Range, so vegetables can be left to continue ripening if they are not yet ready to pick. If you are ready to harvest and store this year’s crop, however, here are some tips to prolong the shelf life of produce you grow or bring home from a farmer’s market. To harvest most plants from your garden, it’s best to avoid pulling or tugging on plants as that will damage them. Instead, use a sharp knife or pruners to cut stems to remove the produce. Make a clean cut and hold on to the fruit, not the stem. When buying pumpkins, select the ones with a stem still attached if you want them to last through the fall. After harvesting squashes and pumpkins, carrying them by the stem will likely cause it to break off. Without the stems, they will deteriorate sooner. In general, the cooler days of fall are ideal for harvesting and cloudy days better than sunny ones. Morning is the best time to pick produce because that is when veggies have the highest water content. Getting most veggies wet leads to quicker spoilage. 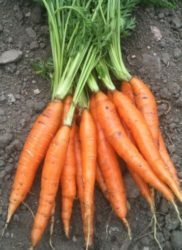 For root crops harvested in the fall such as carrots, turnips, radishes, beets, and additionally, for green beans, getting them wet will shorten their shelf-life. After digging root crops, wipe dirt off with a dry paper towel or cloth and remove the green tops. Root crops will last up to 3 months if kept unwashed in a ventilated plastic bag in the coolest part of the fridge. Carrots picked now will last until Thanksgiving! If you have a cool basement, it can provide excellent storage for root crops plus potatoes, cabbage and tomatoes. Caution: keep carrots away from apples, potatoes and any other veggies that produce ethylene gas as it will make them bitter. Harvested lettuce and other non-root crops such as peas, corn, broccoli, cauliflower and summer squash, need to breathe and have air circulation to keep them from wilting. Avoid wrapping them tightly in a plastic bag. Instead, use ventilated plastic bags and keep produce in the refrigerator. The coolness shows down metabolism and prolongs freshness. For lettuce and herbs, insert a moist towel in storage bags. It will add moisture to help prolong freshness without making the greens soggy. Following these tips can help you enjoy this fall’s harvest well into the months ahead!